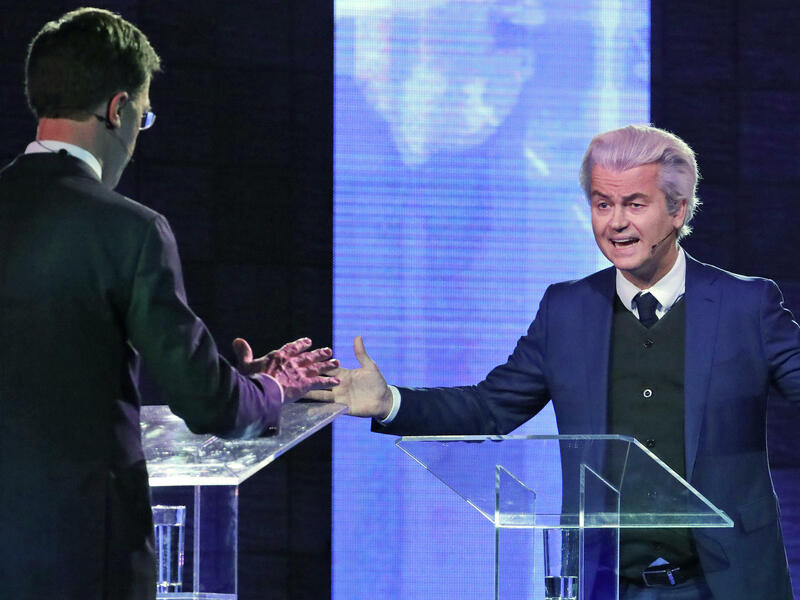 Right-wing Dutch populist leader Geert Wilders gestures as he talks to Prime Minister Mark Rutte during a national televised debate on Monday. Wilders' Freedom Party had been leading in the polls until recently. After the United Kingdom's vote to leave the European Union and Donald Trump's U.S. victory last year, political analysts wonder if populism will gain ground on the European continent amid the impact of a migration crisis and dissatisfaction with the European Union. With elections approaching in France, Germany and the Netherlands, the question has gained urgency. The answer may start to become clearer Wednesday, when the first of these elections takes place and Dutch voters head to the polls. Among the front-runners in the Netherlands parliamentary election is Geert Wilders' right-wing Freedom Party. Wilders, who's been compared to Trump by the Dutch press and some voters, is a colorful figure, known for his bleached-blond pompadour and extreme rhetoric. He has been running an anti-Islam, anti-immigrant "Holland First"-style campaign and has vowed to "make the Netherlands ours again." The Freedom Party had been leading in the polls, but recently slipped. So how much does Wilders matter? Two political analysts in Amsterdam weigh in. André Krouwel is a political scientist at the Free University of Amsterdam and Emilie Van Outeren, a political reporter with NRC, a leading Dutch newspaper, spent five months in the U.S. covering the presidential race. Their responses have been condensed and edited for space. Krouwel: He actually mobilizes quite a broad range of people. There's a lot of older voters who feel very insecure about how this country is changing with immigration. They feel like the undeserving are coming into our country, taking away or undermining our welfare state, our healthcare. The other group is people who are at the lower end of the labor market and they feel threatened by labor immigration. Then there's, of course, just people who think that Dutch culture is going down the drain by immigration. They don't like the multicultural society, or they feel like their neighborhood is changing too much. Do you see any connections between the concerns of these voters and some of the concerns that played out in the Brexit vote and Trump victory? Krouwel: I think they're exactly the same people. They are people who not necessarily are poor, but actually have a lot to lose. Trump voters, they earned over $70,000 per annum. You see a large part of the Wilders vote, they're earning a lot of money. Most of them earn more this year than last year, but they feel that they might lose everything. So, it's not what they have, it's what they think they might lose. How does the European migration crisis, the refugee crisis, fit into this? Krouwel: If every night you see hordes of people [on TV] walking down roads with whole families moving this way, people feel anxious about it. They feel like hordes of immigrants and refugees are coming into our country and we're swamped by them. That's also the language that Wilders is using, that we're [being] taken over and we have to take back our country. Is Wilders the Dutch Donald Trump? Van Outeren: No, he's so establishment. He's never held a job outside of the government. Trump's appeal was obviously that he was an outsider and this was a change election for the United States. What you do see is the language. That's something that they definitely have in common and this nativist idea, Trump's slogan "America First." Wilders has made his slogan "Let's Make the Netherlands Ours Again." So there are a lot of similarities, but not as many as people might think. And then there's the hair, of course. If Wilders were to get the most votes, what kind of impact would that have in the Netherlands? Van Outeren: What is new is that in this campaign, other parties have already said they exclude governing with Wilders. So what it will mean is that if his anti-immigration, anti-Islam, anti-EU narrative wins and draws people to the polls, then that says something to the leaders of all these other parties — and they will run a very different government with him as a huge opposition force than they will if he comes in third. How significant is this election in the broader Western context? Krouwel: If you see Brexit, which is an anti-elite vote, if you see Trump beating the hell out of the Democrats, you can see that, wow! Two times, the whole establishment is put to shame. If Wilders also succeeds and then in France, [National Front leader] Marine Le Pen wins in the summer, and then in Germany, the anti-immigration [Alternative for Germany] party does, well, yeah, then I would be really worried. What I think will happen is that Wilders will not be first, but second or third — not play a role in government. In Germany, the Social Democrats will probably be big and govern with the Christian Democrats, very normal coalition. Le Pen will not be president of France, so I think, come early 2018, it has all blown over. But then again, a small thing can happen. What do you fear most in politics? Events, because they can change the course of history.